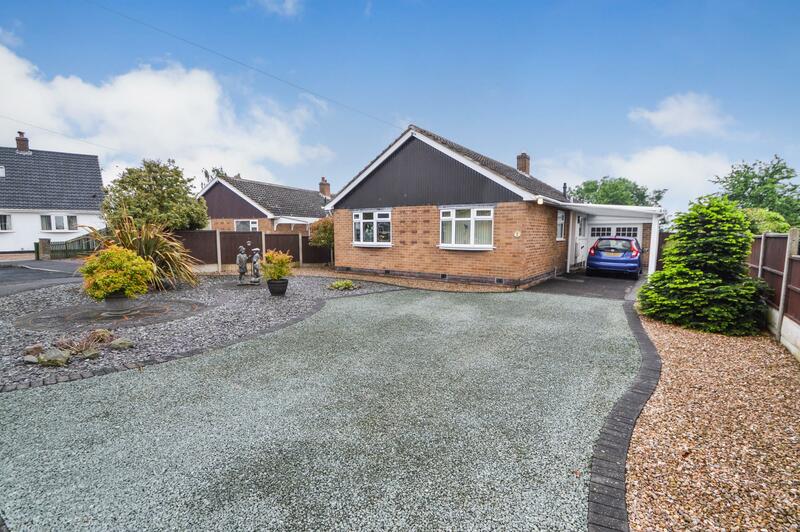 Benjamins are delighted to present this spacious premium two/three bedroom detached bungalow for sale in the South Nottingham Village of Keyworth on Cedar Drive. The property briefly comprises; Entrance hallway, living room, conservatory, fitted kitchen, two double bedrooms, family bathroom, additional en suite to master bedroom, office/third bedroom. large rear garden, large driveway with parking for several cars, garage. Benefiting from gas central heating and UPVC double glazing. On entering Keyworth from Nottingham and through Plumtree continue along Normanton Lane onto Nottingham Road and up to the Square. From the Square take the road to Wysall, which is Main Street. Cedar Drive will then be seen on the left hand side and the property is situated at the top on the right hand side. With UPVC sealed double glazed front door and side panel, radiator, cloak storage cupboard, telephone point and loft hatch. With a range of floor and wall mounted kitchen units complete with single drainer stainless steel sink unit, working surfaces, tiled splashbacks, plumbing and space for washer, space for fridge, double electric cooker, gas hob radiator, breakfast bar, cupboard containing boiler, door giving access to the rear garden. A pleasant and light room with UPVC double glazed bow window to front elevation, radiator, ceiling coving, with a range of built-in wardrobes incorporating wall and drawer units, and vanity unit. With cream suite comprising pedestal wash hand basin, bidet with mixer taps, enclosed shower cubicle with full wall tiling, low flush WC, shaver point, extractor fan. A flexible room which could be used as a bedroom, sitting room or study with radiator, UPVC double glazed window to side elevation, fibre internet socket feed. With UPVC double glazed window to side elevation, white suite comprising panelled bath with single taps, drawn down shower fitting, full wall tiling, vanity wash hand basin, low flush toilet suite with hidden cistern, heated towel rail, small built-in linen cupboard. Beautifully landscaped rear garden overlooking the fields to Wysall and beyond. decking area with automatic electric awning and steps down to a separate lawn area. Hedge and fence borders with a selection of plants and shrubs. Garden Shed with lighting and power, raised vegetable plots. The rear gardens are generous in size, well screened and contain lawns, paved areas, flowerbeds, fruit trees and shrubs. The front of the property has a stone driveway leading to a covered car port, with stone borders, plants and shrubs. Gated access to the side and rear of the property. Garage, double doors, electric light and power, hot and cold water and sink unit.